It’s many people’s vision of heaven – sipping a dram of malt whisky while toasting your feet by the fire. Tasmania is beautifully situated with the raw materials for fine whisky making: an abundance of pure, soft water; good quality barley; and large areas of peat bogs from which to create the smoky fires to dry the barley. 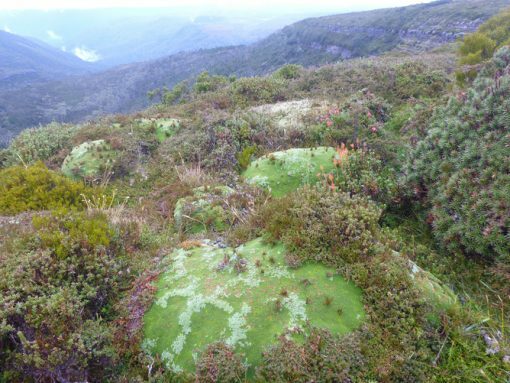 While there is enough peat growing on private property to supply the peat requirements of the Tasmanian distillers, the majority of it grows in the World Heritage Area. 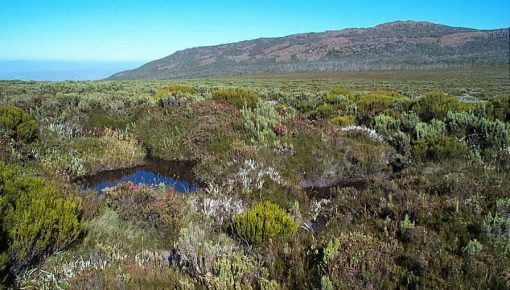 Peat bogs and moorlands underlie most of the alpine areas of central and western Tasmania, and are at least as old as the much vaunted forest trees – like Huon and King Billy pines – they grow alongside. Peat is comprised of vegetation which decays very slowly in the cold, wet environments, and botanists tells us that the peat grows as little as one millimetre a year, meaning that the deep bogs of one to three metres deep have been developing in that spot for millennia. Just as Huon pine carries within it the essence of its own destruction because the oil which preserves it, methyl eugenol, is very flammable and will cause it to be killed by the slightest fire, so does peat’s reservoir of ancient plants provide both its strength and its vulnerability. It was the peat’s capacity to turn into energy-dense briquettes when dried out that made it so attractive to Scottish highlanders looking for fire fuel in a treeless land, and in an Australian landscape shaped, punished and forever threatened by fire, its ability to smoulder for months makes it the most sinister and destructive of neighbours. Experienced fire fighters from other parts of Australia move to western Tasmania, and quickly express surprise when a fire they are sure they put out weeks ago flares again on a day with a warm northerly wind. They start looking for a fire bug, but the local firies are not at all surprised, and head off with grim resignation to put it out. Again. And again. And again, until ‘we get five inches of rain in a week’ . The capacity of fire to smoulder, cold and undetected, in the peat for weeks, until stirred into flames by a warm wind is both remarkable and frightening. While a dry lightning strike on 28th December 2018 was the original ignition for the Gell River fire in the upper Gordon River catchment, it is peat that is responsible for the huge destruction the fire has caused. Squadrons of helicopters and phalanxes of fire fighters from all over Australia and New Zealand have been applying their technology, energy and expertise for almost a month. It looks for a while like they are winning, and then a warm northerly wind undoes all of their good work. 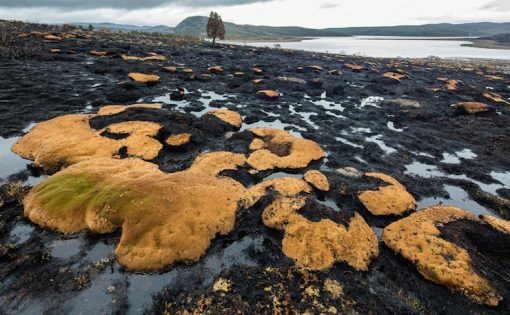 Modern technology is no match for three-thousand-year-old organisms, even when their relationship to fire is not so much an alliance as a self destructive addiction. The suite of fire sensitive habitats which are destroyed alongside the peat in the blaze is a bitter and heartbreaking reminder that not everything in Australia is adapted to fire. When the Gell River fire is FINALLY extinguished – probably in the autumn, and certainly only after 120+mm of rain – the fire fighters might well enjoy a dram of celebratory malt whisky. But I doubt that any of them are going to want to warm their feet by a peat fire while they are doing it.